Imagine the luxury of having your very own steam unit in your master bathroom. With Shower Door of Canada’s luxurious steam unit, you can enjoy ultimate relaxation every time you shower. 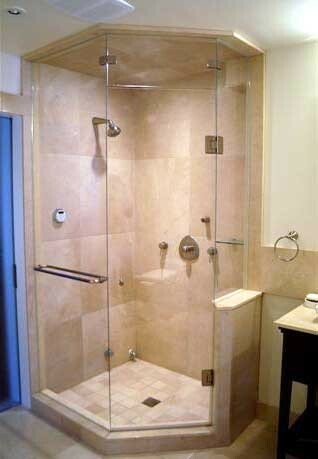 Shower Door of Canada’s steam units are made from tempered glass in 3/8” or ½” thickness, depending on style. Additionally, Shower Door of Canada steam units are available with your choice of moving or fexed transoms. Each steam shower enclosure is custom measured prior to ordering, or is built to specific size or template measurements. These units can literally be customized for openings of any shape or dimensions. You can accessorize your steam enclosure with a variety of styles and colors of hinges and handles. Handle choices include custom-made pull handles, customized curved designs, back to back knob handles, and more. Hinge choices include hardware that connects the glass directly to the wall and those that connect the glass to a glass joint pivot. Shower Door of Canada has been serving the home products market for more than 40 years, and is recognized as the first North American company to install the now-popular frameless shower doors. In addition to installing a full complement of shower doors and systems, the company supplies and installs mirror walls, glass entry systems, staircases and tabletops. Shower Door of Canada specializes in delivering high quality and competitively priced products that meet the standards of discriminating homeowners, interior designers, decorators, architects, and builders of custom homes. For more information, see Shower Door of Canada, where you can view the full line of products and even request an estimate via the firm’s online form.